Missionary David Koenig and Pastor Jyothi Benjamin report on the recent Pastoral Conference in Nellore, India, involving representatives of the BELC and CLCI (India), UMLC (Myanmar), and HCLCN (Nepal). Included also is a photo gallery from this blessed event. Greetings in the saving name of our Lord and Savior Jesus Christ, through whom all blessings flow. It’s a joy to write you about the 9th Asia English Pastoral conference 2009. We all have enjoyed blessings from this conference this year also. It was extremely nice of everyone who were able to participate in this pastoral conference. 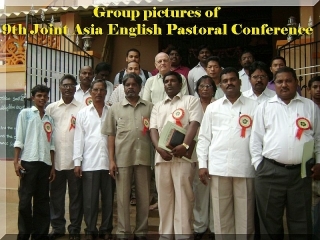 I am sure that all the delegates are greatly encouraged by the enthusiasm generated through this Joint Asia Pastoral conference 2009. The excellent mission reports presented in this conference have added an extra fuel to next year’s Joint pastoral conference Gospel fire. We praise God for the rich input that we have received from our honorable beloved CLC missionary, Rev. David Koenig. On behalf of the Joint India Pastoral conference – 2009, we also express our sincere thanks to the Chairman of the Mission Board – Rev. Bruce Naumann, for his wonderful and encouraging message and greetings. Once again I shake hands with you all for your participation and in praising God for His goodness, and hope and pray that we meet you all in the next year’s conference. Thank you all once again.